iBasso D4 Mamba review | What Hi-Fi? At just 21 x 55 x 92mm, the iBasso D4 is tiny. With good reason, too – as well as being a USB DAC, it's also a portable headphone amp. So, rather than standard stereo RCA for outputting the analogue signal, you get a 3.5mm connection that acts as both aux-in and out, as well as a dedicated headphone output and volume knob. Meanwhile, the rear plate can be detached to reveal space for a 9V battery, but also has a mini-USB socket. You can select which of these you use for power by flicking a small switch. If you're using the D4 with a computer, just connect the two via USB, and connect to your amp through that 3.5mm aux output. The sound is punchier and weightier than with the laptop to the amp directly, lending greater snap and attack to Wild Beasts' All the King's Men. It's not all good news, though, and it doesn't take much of an instrument build-up before the iBasso begins to sound cluttered and confused. Unfortunately, this messiness is compounded by some hardness to treble and sibilance to vocals. 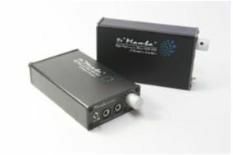 It's actually more successful as a headphone amp, and when combined with an optional ‘dock connector cable' (£26), which connects to the bottom of an iPod, produces a tauter, solid and clean sound than the portable player can manage on its own. Bass weight improves, although a little untidiness and brightness is still evident. The problem is that the DAC component of the iBasso just isn't good enough for it to be recommended for this purpose, and if it's simply a headphone amp you're after, you can buy better for the same money. Sure, it's very portable, but you're probably better spending your cash elsewhere.